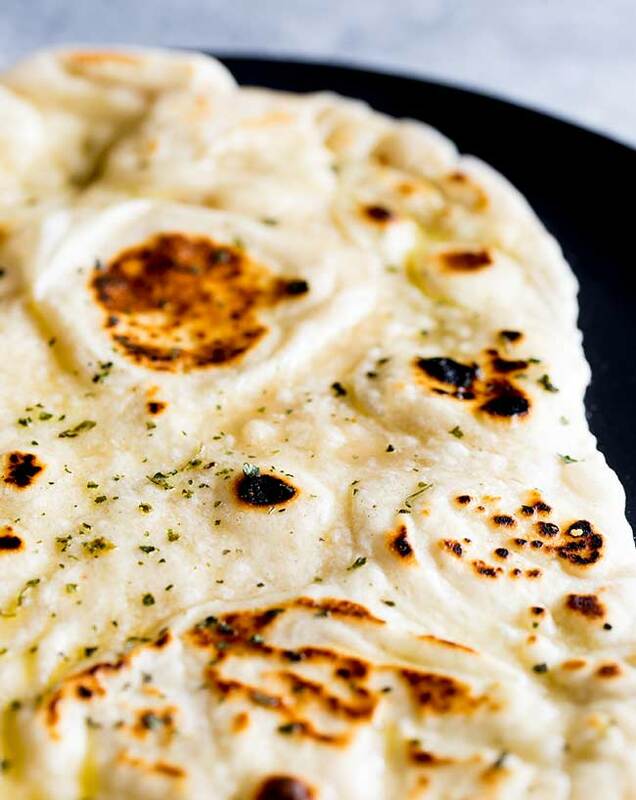 This Simple Garlic Naan is so quick to make and this Indian bread takes no baking. You can make this in a skillet or griddle on the stove top. 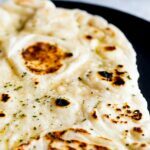 Whilst the dough does have yeast in it I promise this is super easy to make and even if you have never made a yeast dough before you can learn how to make delicious Indian style bread at home. 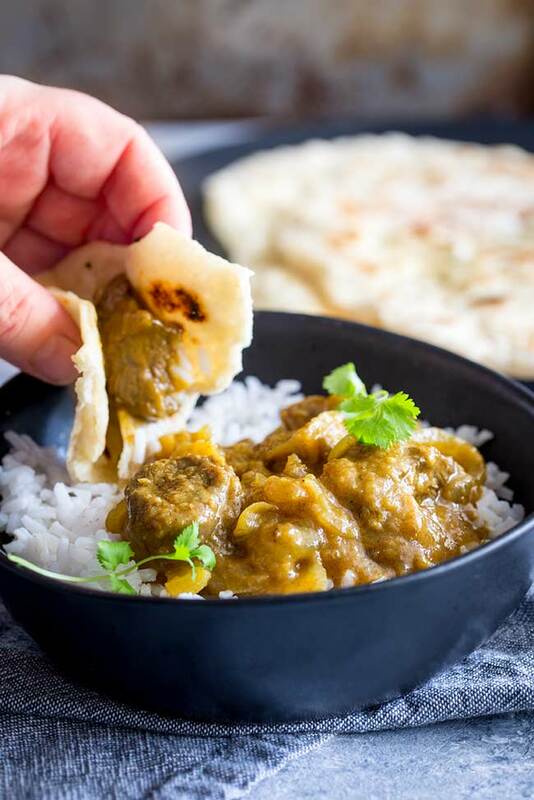 What is better than serving your curries with a homemade bread recipe. Naan Bread using a yeast dough recipe. 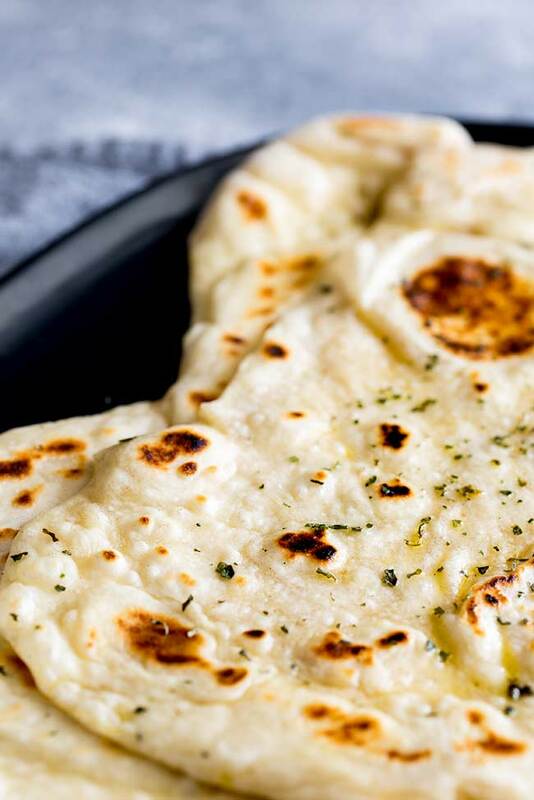 This simple garlic naan bread uses a really easy yeast dough. Please don’t worry if you haven’t cooked with yeast before. It is fun stuff and really isn’t as scary as people think. The recipe uses just a handful of ingredients. Once you have the ingredients measured out, the mixer creates the dough and then you let the yeast do its magic. It really is fabulous to watch. Unlike most yeast dough recipes, this one doesn’t need to prove for hours. Just 20 minutes is enough to let the yeast start to work. Once the dough is ready to use, you can use your hands or a rolling pin to shape it into naan breads. I like to create the traditional teardrop shape, but as long as your bread fits in your skillet or griddle then the shape doesn’t matter. Can you freeze yeast dough? You can either freeze it as soon as you have mixed it or freeze a portion after it has risen. The yeast will lay dormant in the freezer and as you defrost the dough it will start to come back to life and make you naan bread puff again. Once the dough has been rolled out, you want to get the skillet/griddle super hot, so the dough cooks instantly. Place the dough on the skillet and let it cook for 2 minutes, then flip and cook for a further 2 minutes. Remove the bread to a plate and drizzles with the garlic butter (or eat plain). Cover with foil whilst you cook the next naan bread. 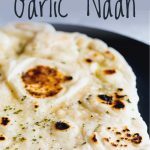 What to serve with these Garlic Naan breads? 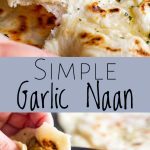 These simple garlic naan breads are perfect with curry, but don’t just stop there, they are also great with stews and soups! 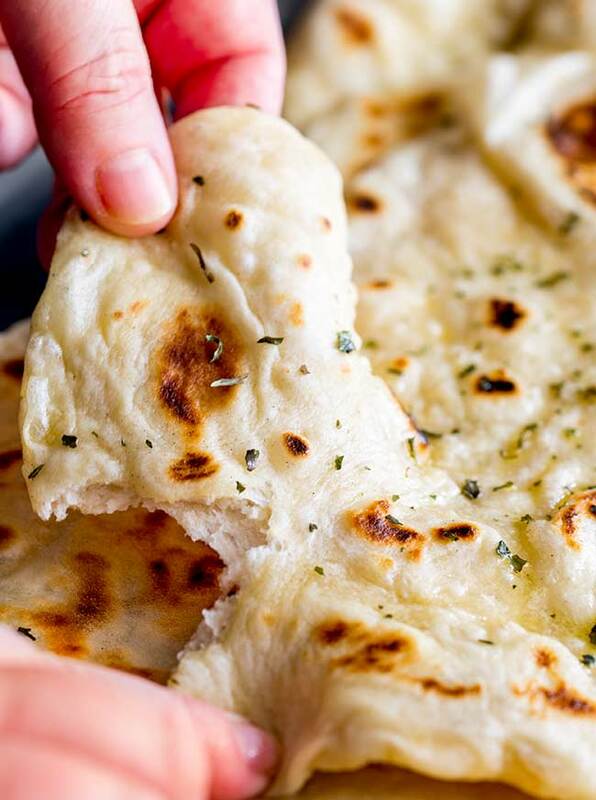 Pin this recipe for Simple Garlic Naan Bread. Pin it here. Set your stand mixer up with a dough hook. Place the flour, yeast, salt and sugar into the bowl of your stand mixer and mix on low to combine. Pour in the water and oil and mix on low for 10 minutes until you have an elastic dough. Cover the bowl with cling film and leave it to rise for 20 minutes. In a large mixing bowl, combine the flour, yeast, sugar and salt. Add the water and oil, then use a fork or butter knife to combine all the ingredients, once you have a raggy looking dough, start using your hands to bring the dough together, until the sides of the bowl are clean. Empty the dough on a floured board and knead the dough for 15 minutes. Place in a bowl, cover with cling wrap and leave for 20 minutes. Once the dough has sat for 20 minutes, punch it back down and then divide the dough into three roughly equal balls. 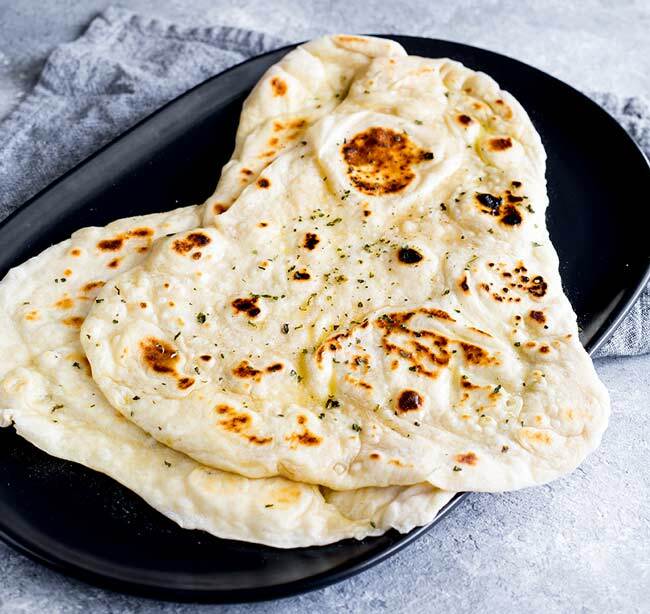 Place one ball on a floured board and use your hands or a rolling pin to form the naan breads into oval/teardrop shapes (ensure they will fit in your skillet/griddle). Put a heavy skillet/griddle over a high heat and allow it to get searingly hot. Place the dough onto the skillet and cook for 2 minutes, it should start to puff up and charr lightly. Flip the bread and cook for a further 2 minutes. Remove to a plate and drizzle with the garlic butter. Cover with foil and keep in a low oven whilst you prepare the other breads. Place the butter in a small microwavable bowl and microwave for 45-60 seconds or until just melted. Stir in the garlic flakes and dried cilantro. 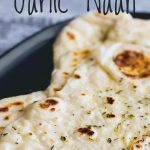 If you love food why not subscribe to my newsletter, I will drop you an email every now and then, just to say hi and send you a couple of recipes I think you might love, like these Simple Garlic Naan Breads.